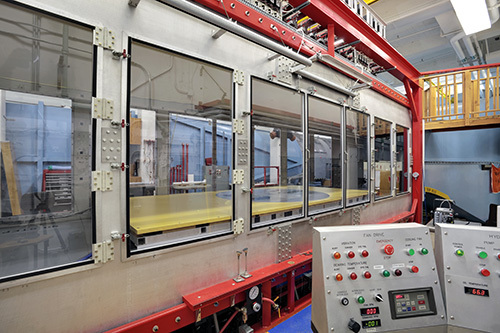 The Lucas Wind Tunnel was designed to fit within the confines of the 90 x 30 x 20 ft room in which it sits. In some places, it is inches from the wall. Filming in the tunnel poses some lighting and focal length challenges due to the small "spectator" spaces. Full-size adults do not fit in the tunnel. Test section as seen from control panel side. Photo by Seth Hansen.